Free JV with Promo Code, Details Inside! Specials on Ad Packages with Super Solos!! 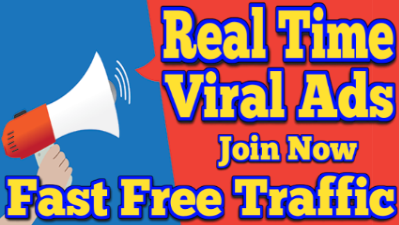 It's simple to get started at Real Time Viral Ads! We are a List Mailer Ad Exchange... join right now for free and grab your guaranteed traffic right to your site using out proven methods of advertising! Become our Latest Verified Members for Free! JOIN NOW - Email Everyone that joins behind you! Pro members can mail every 3 Days. JV members can mail every 2 Days. Super JV members can mail EVERY DAY! As a Member, You Can Email Your Referrals. You Earn 1000 credits for each referral You Make, as well as Extra Credits and Commissions! We Have Referral Contest Inside, Winner Gets Cash and Ads! Get more traffic to your websites with our RealTime Referral Builder! Everyone who joins receives a free ad package, But we don't stop there, ALL active members, even free members, will get a monthly bonus ad package added to their account automatically. Plus, if you upgrade, you most definitely enjoy even BIGGER benefits! Instantly Mail! Sign Up Free Right Now and Get Started! Our Viral Mailer will let you email everybody that joins our exchange after you! Set up 468x60 Banners, 125x125 Banners and Text Links that are included with your sign ad package! You can Reach 50,000 double Opt-in members with our Network Ads, RTE Network Ads and Super Mega Network Ads Reach the members of over 200 ad exchanges! Get your share of targeted traffic, build your downline, email your referrals and earn cash commissions! Post! Click! View! That is all there is to it. So When I Promote - You Get Traffic to Your Super JV Link!